Naomi Rincon-Gallardo "The Formaldehyde Trip"
The Formaldehyde Trip is part of Galería’s series, Queerly Mexican – an exploration of visual dialog across borders and generations about the ongoing struggle to be simultaneously Mexican or Chicanx and queer. Queerly Mexican will feature a series of artist residencies that will culminate in an exhibition in the Spring of 2017 that seeks to transform cultural politics of national/ethnic identity that rest discursively on patriarchal constructs of heterosexism and machismo, narrowly defined womanhood, and rigid binaries of gender and sexuality. 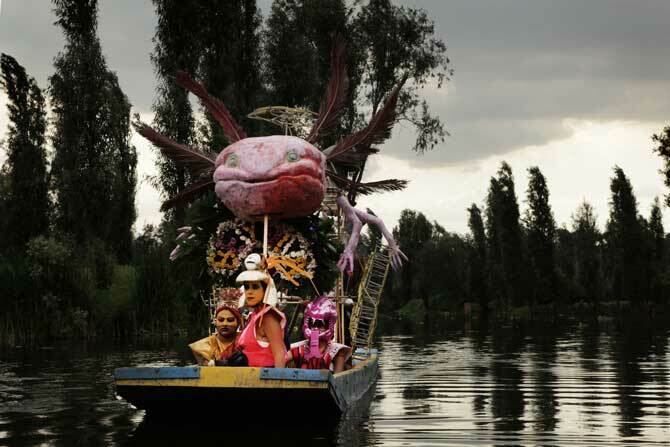 During August 2016, Mexico-City-based artist Naomi Rincon-Gallardo will be in residency developing a new performance and video that weaves together Mesoamerican cosmologies, feminist activism and theory, and indigenous women’s struggles for their territories. This new piece, The Formaldehyde Trip, imagines the murdered Mixtec activist Alberta “Bety” Cariño in her journey through the underworld. As she encounters warriors, witches, and the dual-gendered goddess of death, Cariño transforms from an individual to a collective body, a radical sisterhood of the future budding towards her rebirth. We have partnered with SF MOMA to curate and present The Formaldehyde Trip.